2" Height stability is enhanced by locking the air into place in each of the FOUR compartments through the simple use of the ISOFLO® Memory Control, minimizing side to side and front to back motion. Provides 1.5 in. of immersion. The QUADTRO SELECT® Cushion sets the standard in the industry for overall performance in wheelchair seating. 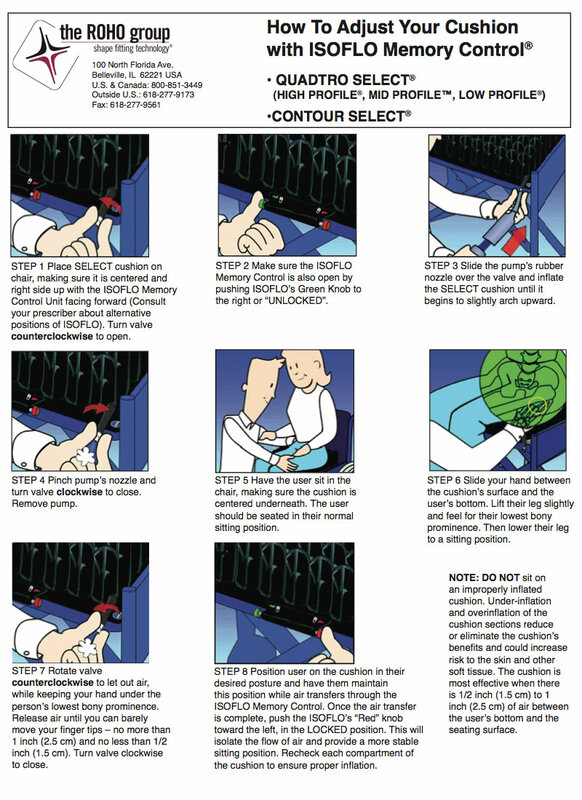 Each and every user will benefit from a customized fit through the simple push of a knob. The revolutionary ISOFLO® Memory Control offers shape fitting capabilities while the user is seated, allowing quick and easy on-demand adjustment to maximize function. With the built-in stability and simplicity of the QUADTRO SELECT Cushion, no longer will you have to sacrifice maximum skin protection to get stability, positioning or convenience. The QUADTRO SELECT Cushion does it all. 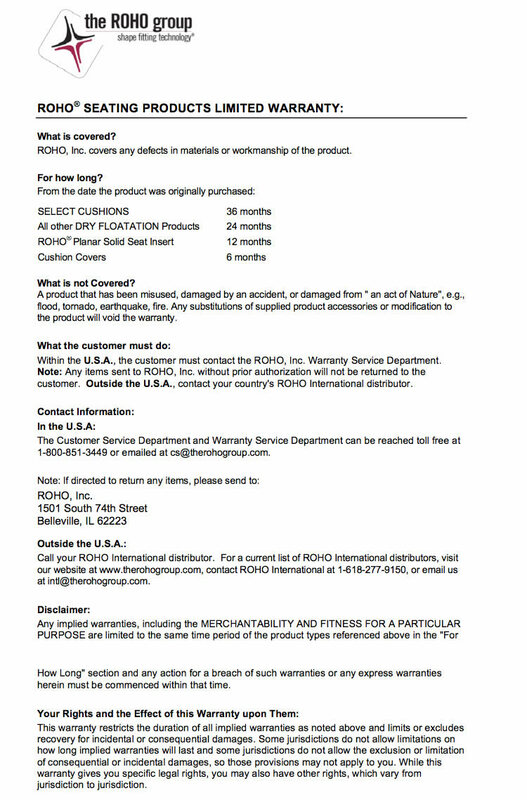 Please Review ROHO® SELECT® Cushion Sizing Chart prior to ordering. Includes: QUADTRO SELECT Cushion, two-way stretch cover, hand inflation pump, repair patch kit, and operating instructions. Weight Limit: Unlimited when properly sized to the individual. U.S. Medicare Code: E2624/E2625, adjustable skin protection and positioning wheelchair cushion. Positioning. A perfect position to match any activity. Now you can adjust positions throughout the day, as your changing activities demand—all while seated. Just push the ISOFLO MEMORY CONTROL® to the open position and adjust to the desired sitting position. Then switch it back to the closed position and this new posture is locked in for maximum comfort and function. Skin Protection. Superior skin protection has never felt better. Based on thirty years of research and client experience, our patented ROHO DRY FLOATATION® technology provides unparalleled performance in facilitating blood flow by fitting, matching, and tracking your shape. Stability. The QUADTRO SELECT Cushion offers a new level of stability never before found in an air floatation cushion. Stability is enhanced by locking the air into place in each of the four compartments through the simple use of the ISOFLO® Memory Control, minimizing side to side or front to back motion. Convenience. All postural adjustments are made while the user is seated, eliminating the need for transfer on and off the chair during the evaluation process. In addition, the QUADTRO SELECT Cushion allows the user to selectively change their position throughout the day as their particular activity demands. Adjustable: Fits specific seating needs and unique body shapes. Lightweight: Adds minimal weight to entire mobility system. Washable: Cushion can be easily cleaned with soap and water. Cover is machine washable. Repairable: Neoprene rubber cushion can be patched or repaired to extend use of cushion. Ventilated: Separate air cells allow air circulation to reach the surface of the skin and provide cooling environment. Have a history of skin/soft tissue breakdown and/or any stage pressure ulcer (including deep tissue injury), skin grafts, and/or myocutaneous flap surgery. Require accommodation of pelvic asymmetry, up to approximately 1 in. 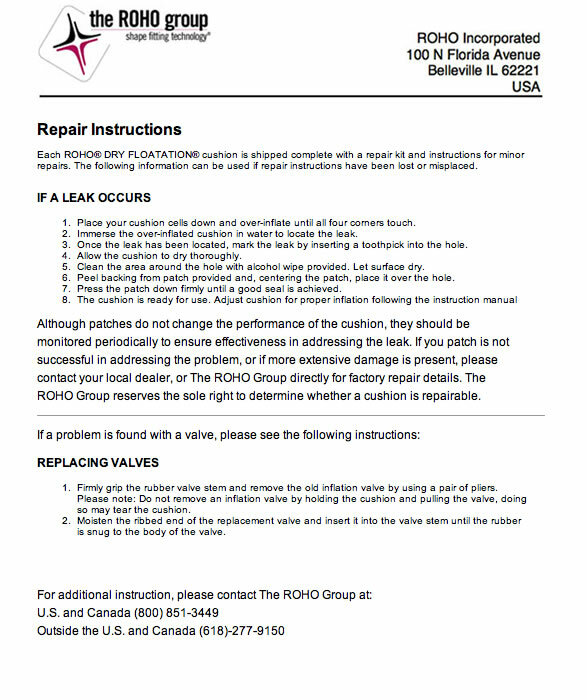 How to Adjust ROHO® QUADTRO SELECT® Series Cushions. If you are using a wheelchair with a sling seat, we recommend the use of the ROHO Contour Base, the ROHO Planar Solid Seat Insert, or a solid seat platform in conjunction with your wheelchair cushion for best positioning results. Please Note: ROHO, Inc. recommends that a clinician such as a doctor or therapist experienced in seating and positioning be consulted to determine if the QUADTRO SELECT® Cushion is appropriate for the individual’s particular seating needs. Please note: By law, hygiene-related products cannot be returned. 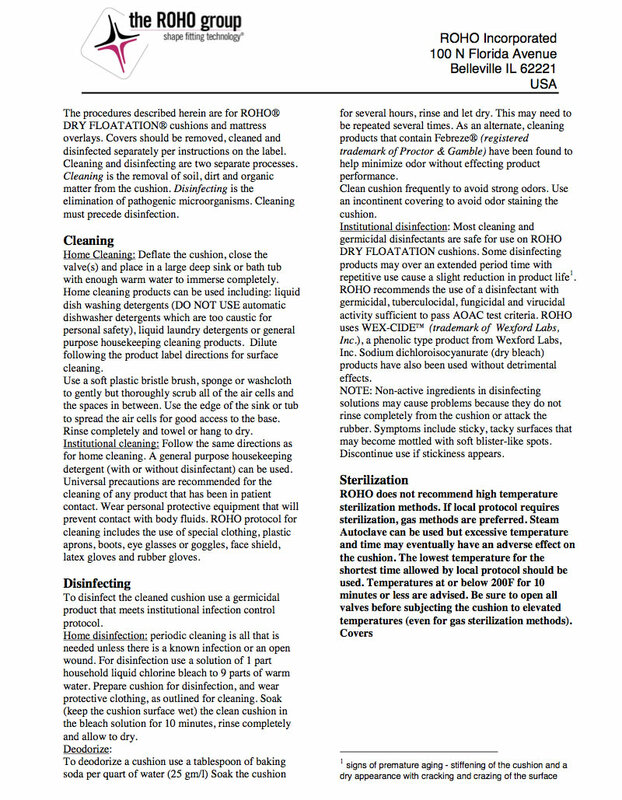 We recommend that you discuss your specific needs with an Adaptive Living Representative and your personal healthcare professional(s) BEFORE purchasing any hygienic product. This item is a NON-RETURNABLE hygiene-related product.